This year we did a few different things with our tree and I'm really happy with how it is turning out~ with 12 children, it is always a "work in progress!" Some of the decorations are old... believe me, we had a bunch of old decorations! I thought it would be fun to add some new things this year. I'm really jiving on the combination of kraft and red, so that is the theme of this year's tree. 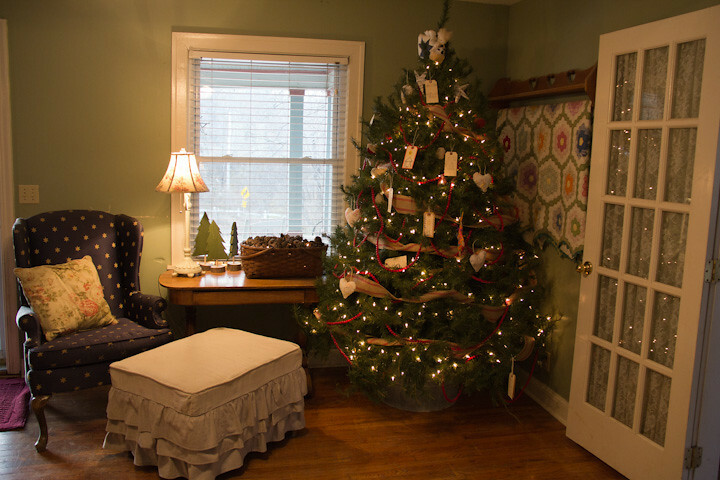 It's a little difficult to see in the photo, but I used an old tin washtub to set our tree in! The boys found it set out for the trash when they were mowing, and I was so glad that they brought it home for me. 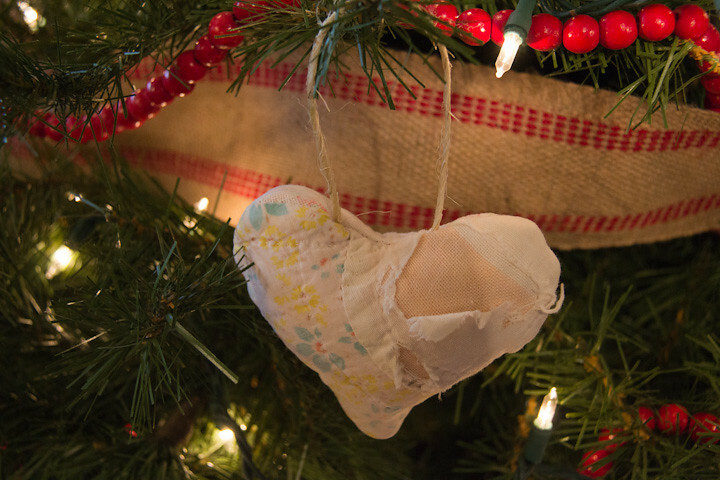 It seemed like our tree skirt was always twisted and smooshed to one side and I was forever fixing it. The washtub was a perfect solution~ cute and it doesn't go anywhere! Tom and I purchased the strings of red beads many years ago. I remember thinking at the time what an extravagant purchase those beads were! We have most certainly gotten our money's worth from that purchase 22 years ago! In addition to the beads this year I added several yards of jute upholstery webbing with red stripes. I *love* this stuff! The cheapest place I found it was at the Online Fabric Store. 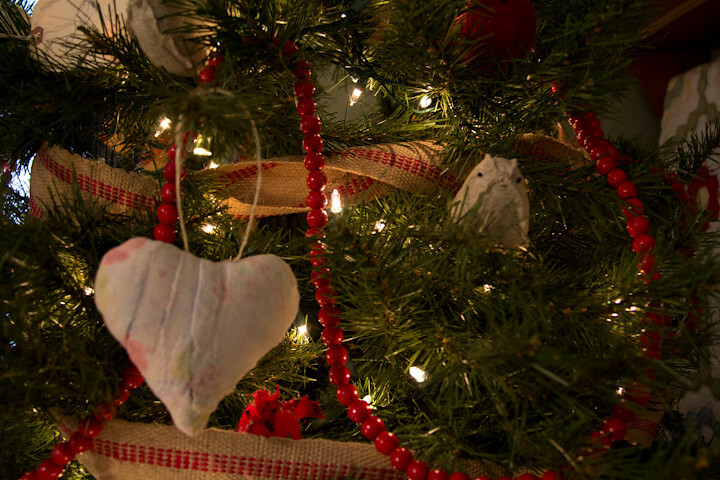 Do you like my little stuffed heart ornaments? I had a very, very worn out quilt that I picked up at a yard sale some years ago. It finally become so threadbare that I couldn't wash it any longer so I decided to repurpose it. 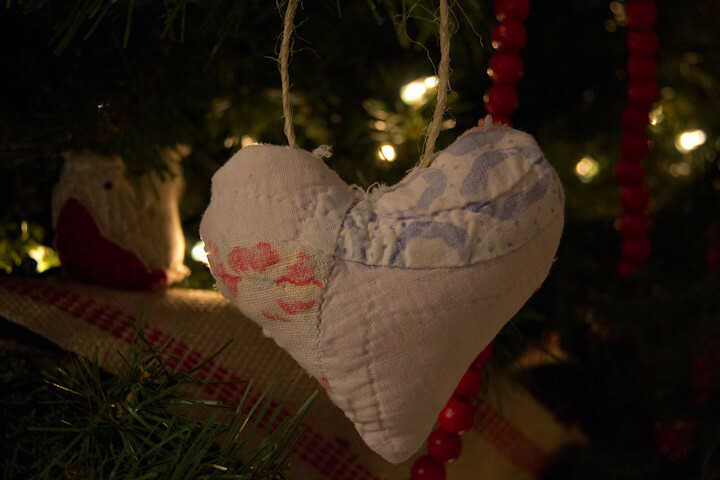 These 6 little hearts were the first thing I made (I have plans for pillows and a "new" bunting for my kitchen and also my studio area as well!) 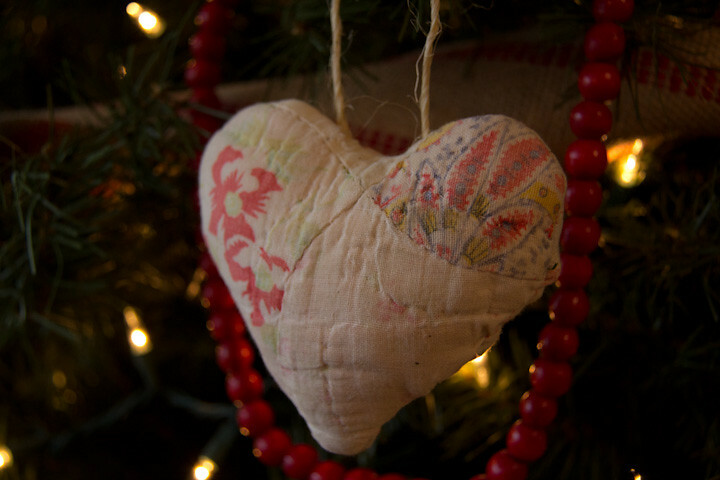 I felt like I was doing something terrible by cutting that poor quilt, but now I am so happy with the sweet little heart ornaments. 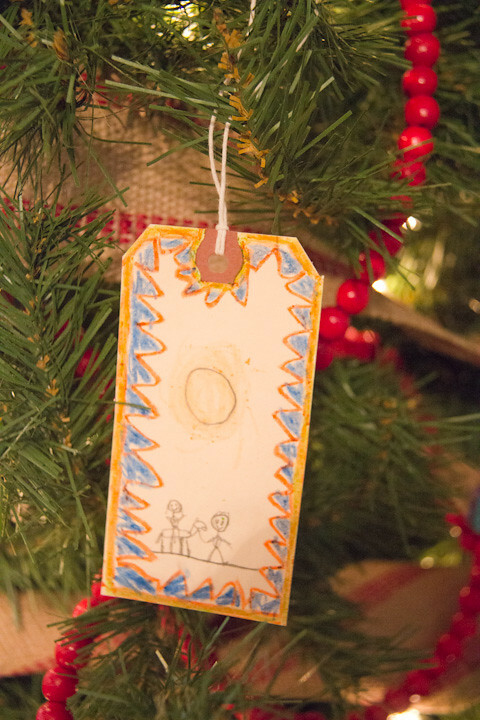 This year we had fun involving the children in decorating simple manila tags. I am planning on adding additional tags... some with the different names of Jesus and the Bible references for each name. 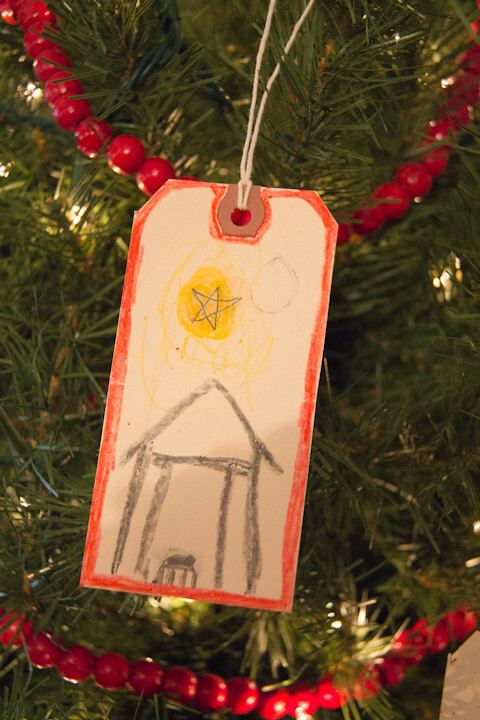 It has been fun for the children to work on these during our devotions time this Advent season. 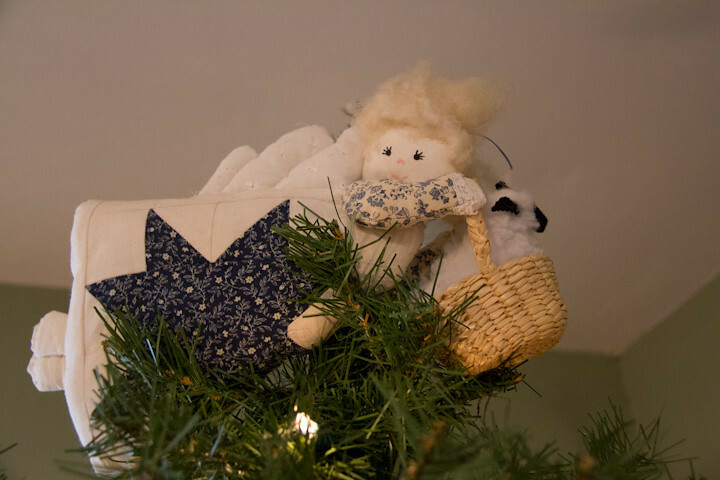 I made the little quilted angel with the lamb in her basket many years ago... I think she is so cute! 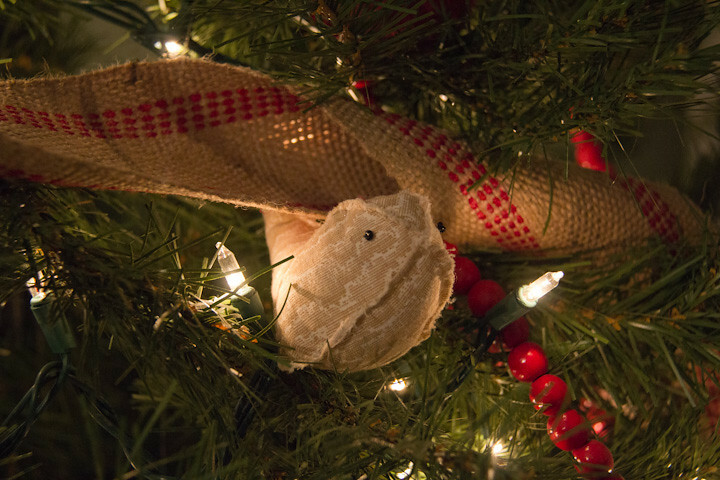 I had a little fun with my camera, capturing some Christmas bokeh as well... oooohhhh! Come! Let us worship Him! Lovely, lovely. Beads, hearts, washtub, and all! I'd say more but my time is up on this thing and I am being paged...Take care! Simply lovely! I used to have red beads, too! 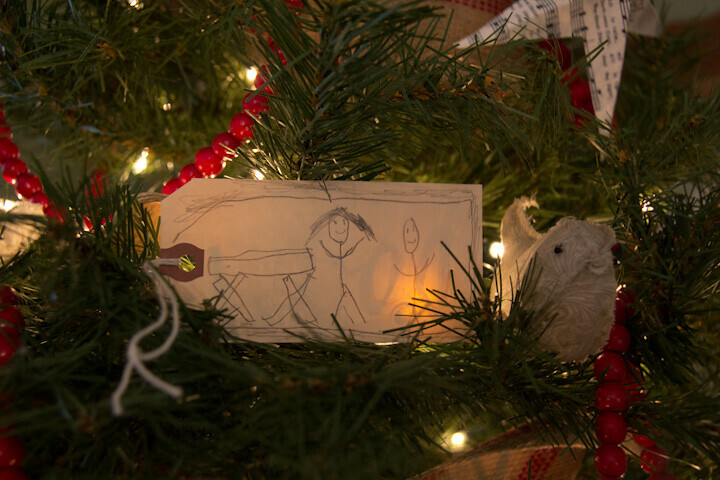 Thank you for the great ideas for ornaments, too. Your tree is absolutely gorgeous!! Awwwww beautimussss! Our fam is enjoying the CHRISTmas season......listening to sermons......singing songs and like you worshipping my King! Thanks everybody! 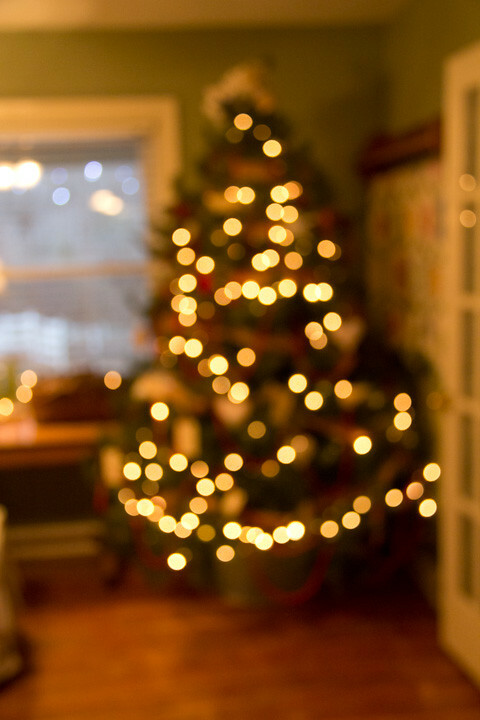 Merry, merry Christmas to you!